Outlook Message Manager is a most complete solution for your immediate business communication and internal operation management. The application allows you to send text and multimedia messages to mobile phones all over the world via Internet directly from your PC and email client. Outlook Message Manager lets you compose and send SMS and MMS messages in a most convenient way and in the time you want it. It is an add-in, or a program installed as an addition Microsoft Outlook. • Compose and send SMS and MMS messages to your Outlook address book’s contacts throughout the world, with intelligent downsizing and conversion of multimedia files for MMS. • Save the SMS/MMS messages you created, so that you can edit them later and send them again. • Send multi-part (concatenated) SMS messages. • Send messages to multiple recipients. 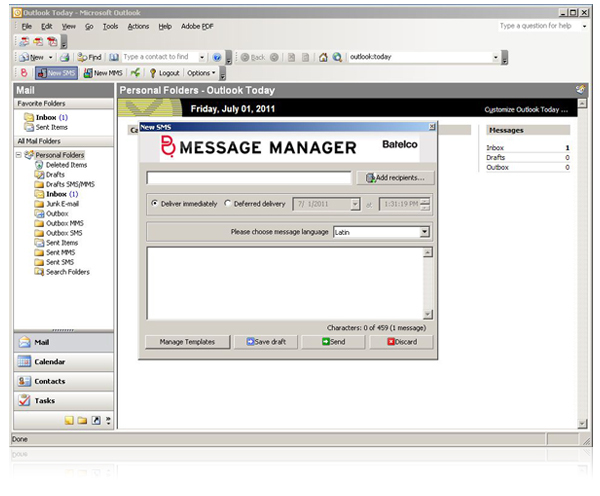 • Send SMS notifications for meetings and appointments created in your Outlook and for the e-mail messages you received. • Receive SMS notifications for incoming and outgoing e-mail messages. • Use the power of Microsoft Outlook to manage your contacts and define recipients for your messages and notifications.